A larger picture of the tree can be seen here. 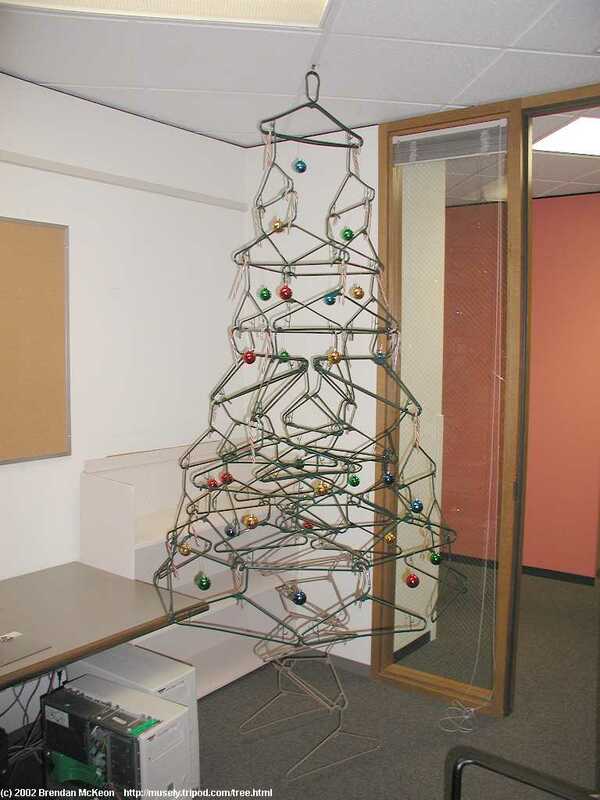 So, one day, I had this idea of making an xmas tree out of coathangers. I don't know why this thought occurred to me, and it's probably best not to ask, just in case I do come up with an answer. Anyhow, my initial plan was to have three 'ridges' of hangers, each ridge comprising several hangers sharing a common baseline, but offset from one another by some amount. These would be tied together with twist-ties; and then the three ridges formed into a pyramid, with the hooks facing outwards, so that decorations could be hung from them. It didn't work - too much hassle to tie the hangers together. And, as any experimental coathangeropologist will tell you, when the hassle factor starts to exceed the fun quotient, it's time to look for an alternative. Then it hit me - why not use hangers as [insert deity of your choice] intended them to be used - hang them! From each other! So I stuck a push-pin into the wooden frame above one of the doorways in my apartment, and hung the first hanger from that. So far, so good, one hanger, very simple, and understated in its elegance, still not really more than just a regular coat hanger. Then I hung another coathanger from the end of the first one - and it tilted sideways in blatant asymmetry. Then the gravity of the situation hit me - coathangers have mass, and also act as levers with a fulcrum positioned at the hook. So adding one hanger to another is like adding a weight to a lever in one of those grade-school physics experiments - a turning force is applied proportional to the weight of the hanger and the distance of the hanger from something or other. But the key thing to remember is that it's a good idea to keep the hanger structure (system, really) in equilibrium (ie. not falling over), and that requires adding hangers symetrically. So I added another hanger to that first hanger, giving one hanger with two hung from it, in a nicely balanced equilibrium. Where next? Each hanger has two obvious connection points - at the two acute apexes (apices?) at the opposite ends of its base, so the obvious thing is to keep adding hangers, adding one to each end or each existing hanger, creating in effect a three-dimentional binary tree with coat hangers. There are several problems with this Binary Xmas Tree approach - the first of which is that is consumes hangers at an expontential rate. At a depth of 1, only one hanger is needed; but each successive level requires twice as many hangers as the previous level - a so-called "n/2n" configuration. Successive levels in a "n/2n" tree would require 1, 2, 4, 8, 16 - and so on hangers. A tree 10 levels high, which is only moderately tall, would require 1023 hangers, which, even at the going rate of 30 for $2.99 at the local Fred Meyer's, would cost $101.66, plus state sales tax (which could, in theory, be avoided if Fred Meyer's could be pursuaded to make edible hangers). While obtaining $101.66 is not entirely out of the question, another obstacle remains - space. Because each hanger is hung at a 90-degree angle from its parent, it is inevitable that hangers will end up colliding with their cousins at the same level in the tree. Indeed, this happens at the third level in the tree; and while it can be managed at the third level, the problem is considerably more severe by the fourth and fifth levels. The only way around this problem is to use a space with more dimensions - a 10 level tree would likely require 7 dimentions to allow enough hanger rotations to avoid collisions. Unfortunately, not only is 7d space rather hard to obtain, but it is unlikely that my landlord would be willing to allow me to introduce extra dimensions into my apartment, as it would make the calculation of rent per square-ft very non-trivial. Additionally, it would completely confuse and very likely traumatize the carpet cleaning people. The solution to both these problems is to abandon the Binary Xmas Tree aproach at the third level. This level has four hangers; the breakthrough is to add not eight hangers as per the Binary Xmas Tree pattern, but to add just four - with each hook of these added hangers hooking through the ends of two adjacent hangers from the level above, coupling them together. One of the key benefits of this self-coupling strategy - where n hangers on one level are used to couple the n hangers from the previous level - is that it provides some rigidity and shape to the hangers - they are no longer hanging freely and rotating any which way. Instead, each layer provides structure to the level above it, in addition to providing points from which the next level can be built. This technique is actually one of the cornerstones of Structural Coathanger Engineering. In addition to using a single instance of a "4/4" configuration near the top of the tree, an 8-level "2/2" version is used to form the trunk of the tree. Finally, a single level of "8/8" is used to form the lower part of the outer frame of the tree. This is the structure at the fifth level of the tree, comprising eight hangers, in four pairs. These are the only hangers which are propertly normal to the surface of the cone - all others are tangental, or trivially normal, as in the case of the first hanger and the hangers in the 2/2 structure that forms the trunk. The four hangers in the fourth level could have been coupled using 4 hangers, using the 4/4 technique, but that would force those coupling hangers to be tangental. Instead, using four pairs of two hangers allows the previous level to be 'indirectly coupled' - and the normal orientation of these coupling hangers allows the structure to grow both inwards - providing points at which the 2/2 trunk can be attached - and outwards - providing for a continuation of the outer surface, with an increased circumference. This normal structure also acts as a pivot - the angle of these hagners is determined by the reletive masses of the inner versus outer structures which it supports. In effect, where normal pivots are used, it is required to used both the innter and outer connection points so that the overall structure remains in equilibrium. The inner and outer structures are also necessary to couple the four pairs of hangers together, so that each pair of hangers effectively acts as a single hanger to couple the hangers in the layer above it. A final note about this normal pivot structure is that it supports three substructures - the inner trunk and outer skin as noted above - but also supports a two-level 4/4 structure, which is hung from the outer points of the normal hangers. This small 4/4 structure exists purely to fill the otherwise empty space at the next level. One consequence of using hangers in a normal - as opposed to tangental - orientation is that they tend to leave holes in the 'surface' of the structure. As noted earlier, the trunk of the tree is a repeated 2/2 stucture. It attaches to the normal pivot stucture using each of the initial two hangers to couple four hangers from the pivot. This is the one point in the tree where perfect circularity is lost - while this coupling does allow the 2/2 trunk to be attached, it also deforms the previously circular shape of the tree to elliptical. Finally, attached to the outer points of the normal pivot is a 4/8/8 skirt, which completes the outer surface of the tree. The tree was then decorated using cheap 50% off discounted decorations from a local Bartells drugstore. In total, 64 coathangers were used. The top, or 'root' hanger, was agumented with a second hanger to provide greater support after the single first hanger was observed buckling under the weight of the tree. An interesting question is whether it is possible to come up with a general design which will allow for an arbitrary sized cone-shaped tree to be constructed in a regular fashion. This is an issue which I hope to explore in more depth next year, provided I can secure sufficent rearch funding. All content (except Tripod banners) © 2003 Brendan McKeon.